My boy is staying at home today because he has high fever and is coughing. He told us last night during dinner time that he couldn't finish his dinner because he didn't feel well. But we thought he just pulled a trick for not finishing his dinner. The fever went up last night and I asked my husband to move him to our bedroom so I could keep checking his temperature. The weather has been really bad last week, very hot and dry. Sometimes the weather changed very quick from very hot in the morning and raining in the afternoon. I made the appointment with his doctor this afternoon, hope the fever will go down today. I didn't have any plan in my head to make bento for my girl, but then in the morning I figured it out to just quickly decorated 2 quail eggs for her bento. In the other box : grape tomatoes, jelly in the silicone cups, acar (Indonesian's cucumber pickles), yellow tofu, and 3 chicken meat balls mixed with carrots and corns. 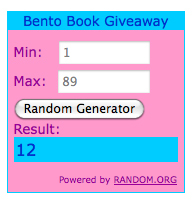 Congrats to Tona Mama to win the Bento Book! Congrats to Yenny to win the Hello Kitty Bento Set! The winners will be contacted by e-mail soon, so please check on your email later! Hi Lia, so sorry to hear about your son. I understand it must be quite troublesome for mom (like us) if our children get sick. Hope nothing serious happen and perhaps only change in weather affect his health. Get well soon! Ow, very cute of quail eggs! the hat pick really add the nice touch. Oh dear! Hope Andrew is feeling much better now. I know how the crazy weather can cause havoc to kids' health. My boy started coughing again... probably caught the bugs from school. Congrats to both lucky winner! Nice job for not preplanning! Quail eggs so fun to use. So mini, they are already cute :) Get well wishes for Andrew. Hope all is better today. So sorry to hear that your boy fall sick, hope he will get well soon and please take good care of yourself too. Oh dear, hope your boy getting well soon Lia! It is so worrying and tiring when the kids fall sick! Oh my. A sick child is every parents nightmare. Hope your son gets well fast. Even with such short timeframe but you can still come out with such nice and and wonderful bento. I really salute you. @Vanessa : Yup, blame it on the bad weather hehehe ... If no fever than it should be okay, but he always gets fever that makes me worry. Thanks a lot Vanessa! @Kids Dream Work : Thanks a lot Ai Ping! Agreed with you 100%. Hey Lia, even for a quick bento, yours are always so incredibly cute and well presented! Oh, so sorry your little boy has a fever. I hope he feels better soon. I'm feeling just like him at the moment myself. Only wish I could stay home too! Hope his fever goes down.. poor kiddo! Lia, so sorry to hear about your boy. Hope he is feeling much better by now. Sorry to hear about your boy...hope he recovers quickly! Lia, I am so sorry to hear that your son is sick. I hope will feel better real soon! Your daughter bento is so cute. I love the edamame border and the quail eggs are adorable. I like the square containers too! Very nice. Thank you so much for organising this! I was sooo happy when another mummy msg me this afternoon abt tis! I'm so sorry to hear your little one is ill. May Jesus' Healing Hands be on Andrew! And by His stripes, Andrew is whole and healed. Thank you very much again and May God Bless you and your family abundantly! Congrats to the Winners, they're so lucky. The quail eggs in the bento look really cute. Hope your son is better by now. I'm also having a very bad cough these few days and will visit the doctor again tomorrow. these little egg twins are so cute, and i love the border of neatly-lined edamame beans! so sad to hear about your boy, hope he's feeling better now! The quail egg people are so sweet..another awesome bento! Sorry your boy is feeling sick. I just hate it when my stepdaughter is not feeling well. And no apologies necessary for this bento! I could work for a week and not make one as nice as this. I am sending healing thoughts for your family! @anna2003 : Thanks a lot Karen! The fever is going down a little bit this morning but he seems has a high fever from afternoon through the night. We will bring him to the lab and doctor later this afternoon. @Mommyof2girlz : Thanks a lot for your kind comment! wishing your son a speedy recovery! Feel better Andrew! Wishing you a speedy recovery and that you'll be feeling great again soon. 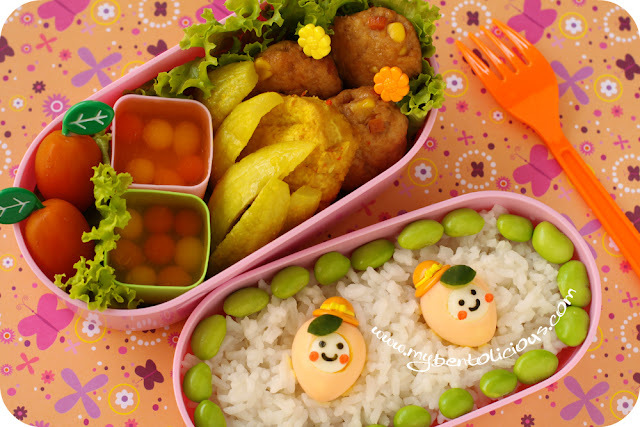 Lovely creative bento with beautifully decorated quail eggs, Lia! Hi Lia,sad to hear about your boy, hope he's feeling better now. You are really a super mum & a creative bento maker. Although your son is sick, but you are still able to make bento for you girl, & the bento is super cute. :) BTW, take good care yourself too.